SINGAPORE - With Sundown Festival 2012 pulling all the stops to bring in leading acts from China, Japan, Korea, Hong Kong and Taiwan, the F1 Pit Building at Marina Promenade is proving to be the place to be, rain or shine, on December 1, 2012. Sundown Festival 2012 features buzzed-about newcomers and some of the region's hottest solo and group acts including Jeno Liu Li Yang from China; Raymond Lam from Hong Kong; BTOB from Korea; Anthony Neely from Taiwan and Alice Nine from Japan. 2012 marks the fourth anniversary for the homegrown Festival, which has emerged to become the definitive all-Asian music and cultural experience of the year. Sundown Festival 2012 is executive produced by Red Spade Entertainment, and is supported by the Singapore Tourism Board (STB) and presenting co-sponsor SingTel, Asia’s leading communications group, for the second consecutive year. Global wireless innovation leader, BlackBerry, is this year’s newest sponsor to come onboard. "It was necessary to continue this tradition every year; it is our promise to our fans and supporters. Anyone who is interested in Asian music and proud of the immense talents the region has to offer should take a look at what is going to go down at Sundown Festival this December 1," said Samantha Chan, Director, Red Spade Entertainment. 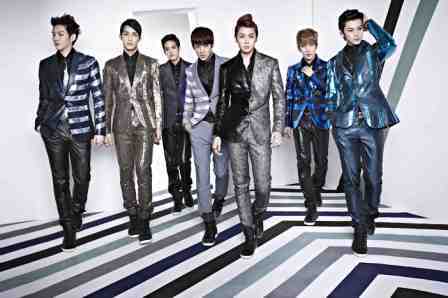 "Sundown Festival has a legacy of highlighting the diversity of the Asian music culture. At the same time, with fans from all walks of life and nationalities banding together to show support for their favorite Asian acts, it illustrates the boundless power music has to unite people and unify differences," said Ellena Liu, Associate Director, Segment Marketing & Communications, Consumer Marketing, SingTel. This year’s Festival is being headlined by visual kei group Alice Nine, whose most recent releases included self-titled album “9” and compilation of music videos entitled ‘Alice in Pictures III’. Riding on the recent surge in popularity and demand for their brand of glam-metal rock and “visual style” of music outside of Japan, Alice Nine’s highly-anticipated appearance at Sundown Festival 2012 promises to be an evening of head-bopping entertainment. Fans of Korean pop won’t want to miss Born to Beat, or BTOB, a seven-man group recently unveiled by Cube Entertainment (the same artiste management that produces talents the likes of 4Minute and G.Na). This Korean band is already reining in fans for its fancy footwork and masked mystique. To complement this amazing line-up of musical entertainment, Sundown Festival will also welcome the Singapore debut of Jeno Liu Liyang, a Guangzhou native whose first shot to fame came when she won Super Girls, a popular singing contest in China, in 2006. With Liu’s soulful vocal, the charm of TVB series singer-actor, Raymond Lam and charismatic Taiwan Mandopop prince Anthony Neely all coming together on one stage, Sundown Festival is set to be a massive hit with those seeking quality Asian music and entertainment. “We are pleased to support local entertainment players such as Red Spade in the development of a strong pipeline of differentiated home-grown entertainment content. As the only annual music festival in South East Asia to unite Asian music and culture, we are confident that the Sundown Festival will contribute to our delivery of unique and original tourism experiences for both Singaporeans and international visitors, and set Singapore apart as a global city with an energetic and innovative entertainment scene,” added Lynette Pang, Executive Director for F1 & Sports and Arts & Entertainment, Singapore Tourism Board. "Welcoming SingTel and BlackBerry as presenting co-sponsors further proves this year will be the best festival we've seen yet," added Kelvin Goh, Director, Red Spade Entertainment. Tickets (all free-standing) are available at SISTIC only. 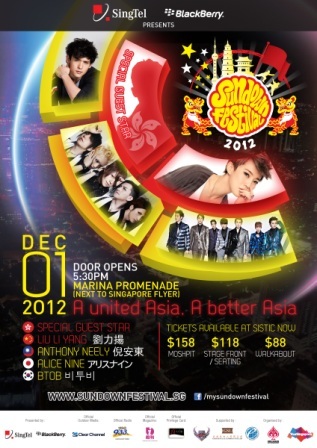 Log on to www.sistic.com.sg to book or call ticketing hotline: (65) 6348 5555. For more information on Sundown Festival, check out www.sundownfestival.sg or contact contact@sundownfestival.sg. The Festival will feature some of the most popular and up-and-coming musicians, on top of their cultural exports (such as food and other consumables) through fringe activities and stalls set up at the event grounds on the Festival day itself. Sundown Festival started in 2009 with the theme Seoul’dOut!, when it focused on Korean music and culture and single-handedly caused an explosion of interest all things Korean (also known as the Hallyu wave) in Singapore. In 2010, Japan was added to the performance line-up, giving rise to the popularity of J-rock and visual kei youth pop culture. Taiwan was added to the mix in 2011, prompting new Asian entertainers and industry players to make Singapore as its maiden stop of fame. Today, Sundown Festival continues to play the role as the purveyor of all things Asian, turning the world’s spotlight to this part of the world and in its course hopes to unite culturally diversified Asia through music. The ultimate goal is to culminate all efforts to give rise to Sundown Festival World Tour of all 11 Asian countries, beginning in home soil Singapore.